Slipped disc in the lumbar spine. Labelled artwork and corresponding axial MRI (magnetic resonance imaging) scan through the lumbar (lower back) spine showing a slipped (herniated) disc. This is a left-sided posterior herniation of the disc forming part of the L1-L2 joint. 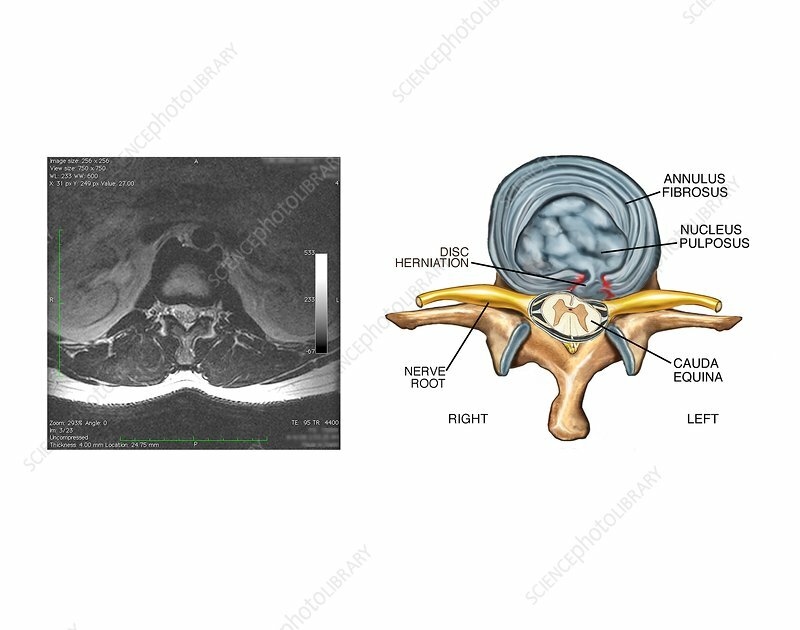 The disc's pulpy interior (nucleus pulposus) is extruding through the damaged outer ring (annulus fibrosus) and pressing on the cauda equina (nerves below the lower end of the spinal cord) and spinal nerve roots. The fibrocartilage discs between each vertebra form spinal joints that bend and flex. Spinal disc herniation can cause pain and in severe cases may require surgery.